Luckily I do have gardening friends; and there is pleasure to be derived from visiting a beautiful garden, discussing plants, sipping Château Trader Joes, and then getting back in my car with the midday sun – only to see my green-fingered comrade resuming his or her weeding duties through my rearview mirror. It’s a bit like playing with a cherubic, golden-haired baby for an hour, only to hand him back to his parents when the diaper feels a bit dodgy. They are all showing off their lilies of course. High summer is the season for outrageous lilies of all shapes and sizes. The strong pink and white ‘Star Gazer’ seems to be a favorite in these parts, followed in a close race by ‘Enchantment’ – a vivid orange Asiatic lily with spots like a leopard. The trouble with lilies of course (besides the fact that flowers commonly termed ‘lily’ rarely are) is the time of the year in which they are not blooming….that is to say, most of the year. True lilies are very often tall, and ungainly, and need staking (though I have recently been told that the charming leviathan ‘Scheherazade’ needs no such tethering). They have such a long period of being out of costume, that without some smart veiling on your part, they are liable to stick out a mile. Of course, had we greenhouses and gardening staff, these troubles would disappear, as lilies are quite happy kept in small pots to be placed outside when buds start to swell, and accordingly whisked away when faded petals offend. I was recently at the garden of a wealthy heiress (name withheld to protect my ability to visit again), whose staff employed such underhanded but ever-so-coveted measures. Militaristic lines of the Asiatic ‘Mont Blanc’ stood at the very tip of their 28-inch reach, anxiously awaiting their debut in the white garden. Nearby, ‘Casa Blanca’ was gearing up for a later, more dramatic entrance. I began to have visions of my children tending stadium-lit lilies in the basement for two hours a day and felt it was best that I exited the greenhouses posthaste. Then there are the surprises. The hybrid lilies that fall in a rarer division (there are eight) or those who simply refuse to be ID’d. On the way to a party the other day, a friend made us later than we already were, insisting that we journey across his courtyard to marvel at an exquisite Asiatic hybrid of buff (he insists yellow), sitting next to the prettiest creamy not-so-red-hot poker I’ve ever seen. Parentage was unknown, but he has promised me a bulblet in the fall. I would like to grow many of the species Lilies – the Turk’s cap or the little North American meadow lily, but have never felt the urge to grow the funereal Easter lily. One would have to be careful in placing just one or two – I can’t help feeling it might successfully shirk its heavy reputation by greeting the gardener en masse instead. 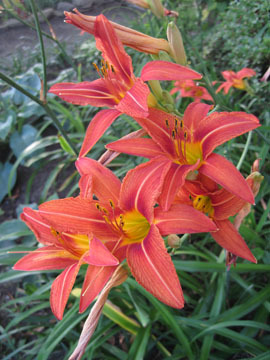 And as for the daylilies….they are merely masquerading. 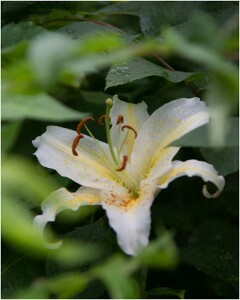 Hemerocallis, not Lilium, and blooms finished in a day. Nevertheless, beautiful at this time of year – even if it they are in someone else’s garden and I can’t cut a spray for the house. Lilies do take over the garden landscape when they are in flower, but I’ve discovered that like all things in gardening it can be risky to rely on one species. I had to remove all the lilies from one section of the garden due to a virus infection, and it’s left a hole in the center of that garden element. Over two years I saw them go from glorious eight foot high Orientals to streaked and distorted specimens that would only threaten the remainder of our lilies. Anyway, just a lily caution as you plan your new garden. It will never stop me from planting lilies but I’ll keep them mixed in with other plants.